Being vegan doesn’t mean there is no indulgence. Craving for a snack one evening, I came across these cookies. They were originally shortbread, but I reduced the fat almost by half and made them into cookies. 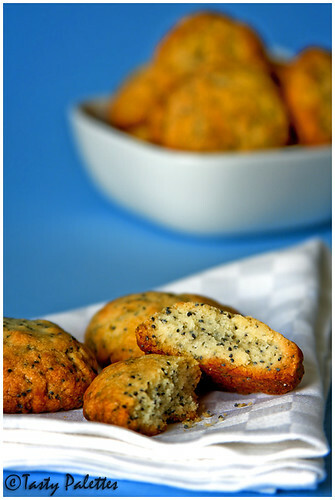 I love lemon poppy seed muffins, no wonder I loved these cookies too. Lemon in cookies is very interesting and the poppy seeds are mildly crunchy at the back of your mouth. These cookies are a keeper. Preheat the oven to 375F. Mix flour, poppy seeds, corn flour, nutmeg and salt together. In a separate bowl, cream margarine, sugar, lemon juice, zest and vanilla together. Add the flour mixture to the margarine mixture and mix lightly. Sprinkle 1 tbsp of water at a time and knead very lightly till the dough comes together. Don’t add water more than necessary. Line a baking sheet with silicone sheet or spray with a nonstick spray. Pinch a tbsp of dough, form a ball and lightly press flat. Bake until the edges are lightly brown, about 18-20 minutes. Cool on a wire rack and store in an air tight container. This yields about 13 cookies. Recipe adapted from Tassajara. And the cookies look so moist and crunchy! I'm a big fan of poppyseeds. Suganya, the poppy seeds must have added that wonderful crackle...love those cookies...beautiful pictures. wow, lovely colours.. i have never tasted poppy seeds in anything. looks yummy! Those cookies look delicious and the sight of poppy seeds dotting a baked goodie is always lovely - will surely try this out! Amazing pics! They look so delicious bet they tasted even better!! Being Vegan is not an easy feet atleast for me, but ready for the challenge, I am trying to watch of all the dishes I cook regularly which will qualify as vegan. Suganya, gorgeous picture as always and I have bookmarked the recipe. I am sure it will go well with any kid of hot drink. LOL...seems we are exchanging cauliflower and cookies very recently.. Cookies look soooo soo yummy.Love the way you've sprinked poppy seeds!! i love the flavor of lemons.... the black poppy seeds make it look so pretty. Poppy seeds looks so pretty.. It did Sunita. It was not crunchy as in crunchy. But after you have swallowed, some the seeds linger in your mouth, and I popped each one of them for sometime. Nags, Poppy seeds are khuskhus. They are black here. Nandita, I perfectly understand. Thank you for your visit here, even with all your constraints. Appreciate it. Hello back at ya :). I am planning to make another double batch, Kalva. They were that good. ISG, Keep your eyes open. I am sure all of us have vegan recipes. We just dont realise it. After so many healthy vegetables, the monkey in the mind starts asking for something not so healthy. This is to keep me motivated. Do try Seema. You will definitely like it. I saw your brilliant creation using corn flakes. What extent you have to go to satisfy yr sister. Am sure she would have been proud with yr entry. Lemon and poppy seeds are meant to be, Laavanya ;). I am somewhat addicted to that combination too! Right, I have everything I need to make them tonight. Thanks! Those really look excellent!!!! I could easily make those cookies gluten-free! Thanks for sharing this great looking recipe!! lovely recipe!!! and gr8 pictures as always! Those look delicious! I have never used margarine...will have to look for some good brand that is also trans-fat free. A butter-free "shortbread" is a challenge that you have pulled off beautifully, Suganya. Even w/o the heavy-handed fat, you have created a nice crumble of a cookie. I love lemon and poppy seeds, too. 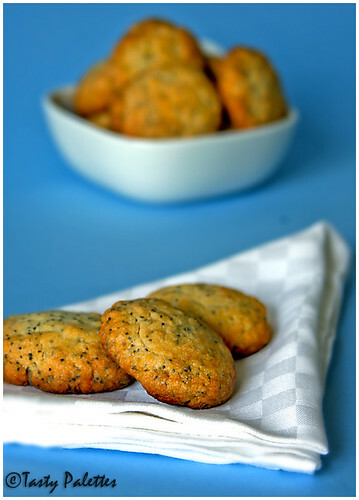 Love poppy seeds, love lemons, love cookies...do you think I'll make these...heck Yeah!!! Love the blue contrasting so sharply with the cookies. 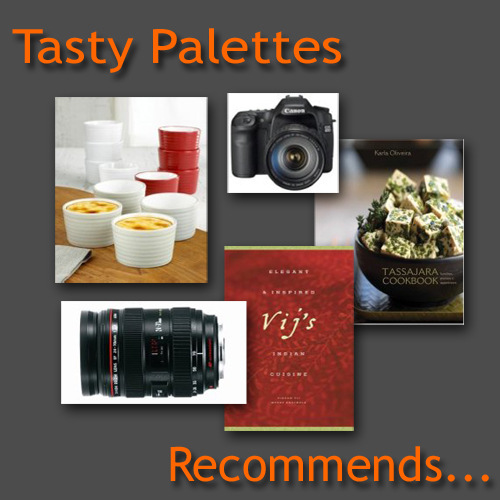 Great shots and great recipe! Suganya...the pictures are great...so wonderful..feel like they might come out of the monitor! I am not sure I will be good teacher :D. But I would be glad to be of help. Sure, let me know, Lucy. I did visit your blog, Carrie. You are doing a great job for people with special dietary needs. Thank you Pushpa, MT, Ramya. Nupur, Trans-fat free is available in the markets. Try spreads. The original texture would have been moist and soft. But this was crumbly. And I am happy with that. I don't want 1 cup of margarine in a dozen cookies :). BTW, your picture is not displayed here. Helen, Pls pls do try. And don't forget to click. I am sure you will paint a prettier picture, you 'Good Looking' Lady ;). I had bought the blue b/g, but it was very tricky to use them in any shot. Even this pic was originally shot in gray. Then a brainwave, i swapped the b/g and it was perfect. Anita from Dessert First is very smart with blue. She is my inspiration. Thank you Sagari and Remya. Love the blue on those pics Suganya... and I am a big fan of lemon poppy seed muffins too... so I am sure these will be yummy! nice picture.Have not tasted cookie with lemon and poppy. Wow! Gorgeous cookies and fab photo! You have an amazing blog. All your recipes and photos are spectacular. I love these pictures! and am glad that you blogged about vegan cookies-great for people like me who don't use eggs! Love the pictures, especially the second one, the cookies look so yummy and crumbly! Sirisha, Not at all. Take your time. All the best. I love the blue too, Sig :). Chai, coffee, hot chocolate. I had it with all of 'em. Tastes good every time. You are bound to love it, Pravs. Thank you for your compliments, Ginger. Glad to be of help, Musical. Sagari, I use Adobe Photoshop Elements. Tjis recipe is bookmarked suganya! :) Looks yummy! Lovely photos. I saw your photo in this month's dmblgit gallery - glad I stopped by for more! Um. These were awful, unfortunately. Like others before me, I had high hopes. That were shattered tragically. Dont waste your time, and your poppy seeds. Um you do know most margarines are not vegan? Tried the cookies and they turned out awesome. My husband and me are a fan of lemon poppy seed cake so these cookies fit just right into our taste buds.